It's a dark and rainy Saturday morning as ACI'S undercover officer arrives at the livestock auction, the crossroads for farm animals destined for slaughter. Every week, thousands of farm animals are transported to livestock auctions, sold and transported again throughout the United States and abroad. Here, animal welfare is a low priority and injured animals are frequently overlooked. In addition to several goats and a large hog in a tight pen, our investigator counts four calves at this auction. One is only two days old. All are shivering from the frigid temperatures. Their harrowing adventure started hours, possibly days earlier, and entailed electric prods, helicopters and ATVs, all working to separate them from their mothers as well as from their natural hierarchical structure among the other cows. The ACI State Humane Officer is the first friendly face they're likely to see. From the time they set foot on the auction property until the cattle are reloaded on trucks or train cars, ACI officers monitor the animals, making sure they are fed, watered, handled humanely and free of injury. But today he remains undercover, pretending to be "one of the boys," hanging around and listening to the ranchers' conversations, hoping to glean information that will lead him to infringements of California's anti-cruelty statutes. The bidding begins and three calves are soon sold. 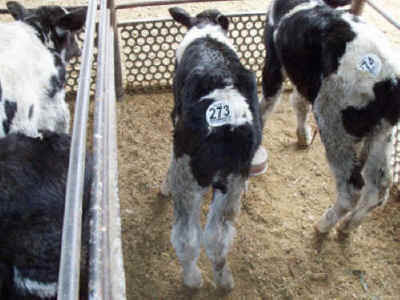 But one calf stands facing the corner of the arena, backside to the crowd. No matter how many times they knee and kick him, he does not move from the wall. The tenacious calf gets shuffled out alongside the others. Concerned about the calf's wellbeing, our officer makes his way out to the animal holding pens and sees a man dragging the calf out the back of the auction grounds. The ACI officer finds out that the calf is to be returned to his dairy to be raised for veal. With a little negotiating and while maintaining his undercover identity, our officer is soon able to walk the calf, who was destined for a life of misery, to his truck outside. The purchase not only saves a life but also serves to drive home the illusion of our undercover officer as just another rancher. The man even extends an open invitation to our investigator to purchase more animals at his factory farm, a crucial step toward ACI gaining entrance into this secretive world. 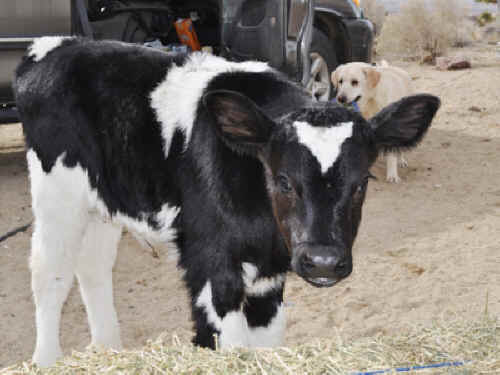 The calf, once destined for a short and miserable life in a tiny veal crate, is now named Carl and lives with ACI's investigator and his five dogs on 10 sprawling acres. Growing quickly Carl lies in the sun most afternoons, grazing in the grass and playing with the dogs. Investigations don't usually end with animals finding loving homes, of course. But they do always result in a decrease in animal suffering. That's why your support is so vital. ACI is tenacious in its commitment to upholding California anti-cruelty laws. But we're only as strong as our enforcement. We need your financial contribution to hire more investigators and get more boots on the ground of the numerous stockyards and livestock auctions within California, as well as our other campaigns, which include investigations into cockfighting, illegal animal street sales, and laws being violated at rodeos. ACI is the only state-approved California organization that is authorized by law to enforce anti-cruelty statutes as they apply to farm animals. We need your help to continue this lonely, but critical fight.